Cooking for a crowd is never an easy feat but young chef Hilda Chan is already a seasoned pro. 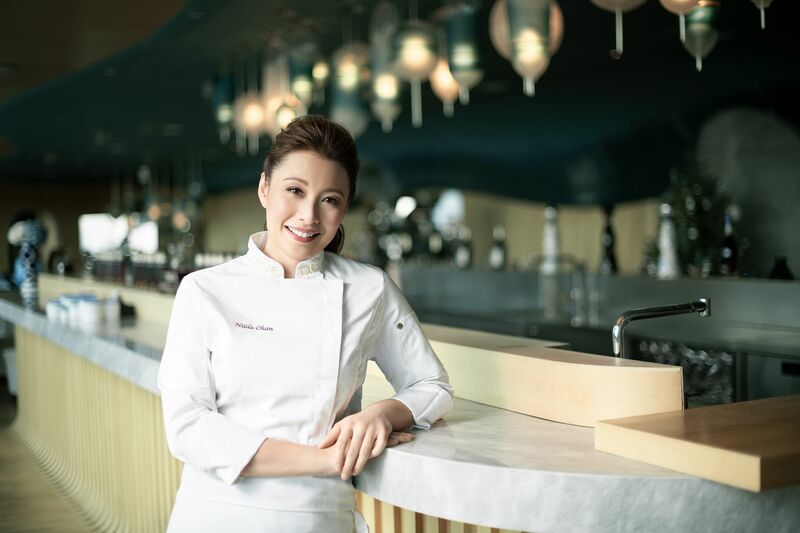 As the guest chef at this month’s Longines Masters of Hong Kong, she will be overseeing feasts for hundreds of spectators each day—numbers the Hongkonger is already used to, having collaborated late last year with the iconic Martin Yan on the WildAid gala dinner in Los Angeles, where they served more than 600 guests. A graduate of the Institut Culinaire Disciples Escoffier, Chan was appointed an ambassador for Disciples Escoffier International Asia last year. Her cooking is firmly rooted in French tradition, to which she adds her own touches of inspiration gleaned from working alongside well-known chefs around the world. I knew I liked to eat. And I liked to travel. I was very lucky when I was young because my dad always loved eating. I was exposed to a lot of different dining experiences growing up. He would take us around and I met a lot of chefs even as a child. When he’d go on business trips he’d bring back local foods from wherever he’d been, too. I remember the first time I tried chilli chocolate with worms, which he brought from Mexico. He told me it was high in protein. He was very adventurous. And did that help build your palate from a young age? My dad would eat anything, try anything. I remember he loved eating this strange dessert, mandarin marinated in some bitter sauce—and he'd drink pure lemon juice after that. He was so extreme! Whereas I wasn't when I was younger. I would try little bits, so I would know what I like and don't like. But at the time I never thought I would go into cooking, until I grew up. When I was studying in the States it was a time I thought about doing more cooking, because I was living by myself. A classic Chinese dish of vinegar-glazed spare ribs. They didn’t have a lot of Asian ingredients at the time. All I had was white vinegar, white sugar and ginger. I actually ruined one pan because I burned the sugar the first time. But I remember feeling proud that I could use Western ingredients to make an Asian dish. I remember it was a huge portion because I got everything from Costco. I was eating it for three days. When did you realise you wanted to train in pastry making? I've always been a fan of desserts, especially macarons. When I first went to France almost ten years ago, it was crazy because there was Pierre Hermé. I had two pieces at the shop, and I immediately bought two boxes to take back to the hotel. You know how each box has 18 pieces? I had 15 that first night. The first flavours I tried were rose and, because it was Christmas, white truffle. That was the point where I realised you can use ingredients from savoury dishes into making desserts—and that's when I got the inspiration and decided to move into [pastry] and learn more. It's also why I didn't want to choose just one side, and so trained in both savoury and pastry. I’m actually more into desserts and pastry right now. You’re more in control. With pastry, you can do more with colours, flavours and seasonal fruits. It’s almost like you’re an artist. You can mould dough, play with chocolate. A piece of meat is a piece of meat; you can’t make it look like a flower. You trained with chefs such as Olivier Bellin of the Ocean and Maxime Gilbert of Écriture. What did you learn from them? More about attitude. They’re both very neat and know exactly what they have to do. I hate working with messy chefs now. The best chefs are always very organised and super clean. Also, never underestimate teamwork—be nice to your team and they will do whatever it takes to make magic happen. What can we expect from your menu at the Longines Masters of Hong Kong? It will be classic French. In terms of appetisers, we’ll have a scallop tartare with salmon roe that has been marinated with yuzu. I’ll also be using French chicken for the chicken roll, which is my specialty. We’ll use the breast and stuff it with ground chicken, some cream and green apple to give it a good balance of richness and freshness, and that will go with a morel sauce. And for dessert, we’ll have a Japanese white peach Melba with homemade vanilla ice cream. The Longines Masters of Hong Kong runs from February 15 to 17 at AsiaWorld-Expo. Make-Up The Private Room by Florence T.
Hair The Private Room by Florence T.